One of the wonderful things about Pattaya is the fact that getting around is so easy, either locally or nationally. Thailand and Pattaya is still fairly cheap when it comes to travel although most of the locals will opt for the bus option where possible. The reason for this is probably because that is what they have always done but many of the nation’s airlines offer flights that are comparable price wise – you just need an airport close to your destination. Here are some of our tips for getting around when based in Pattaya. Getting around Pattaya itself is very straightforward and there are a variety of different options, some more plentiful than others, depending on where you. Prices also vary depending on the level of comfort that you require so it pays to evaluate all the options. Baht buses or Songtaews as they are sometimes referred to, are a fantastic way to get around the city and run along all major routes. The price for most journeys is 10 Thai Baht although for longer distances this may go up to 20 Thai Baht. You can stop baht buses and ask them to take you to a specific location. This generally is around 200 Thai Baht which is very reasonable if there are a few of you. There are lots of motorbike taxis available around Pattaya and they are a fast and cheap way to get around once you overcome the initial fear! Some drivers will have price lists advertising their charges but it is always wise to agree on a price before travelling. Entering into negotiations is acceptable except where they have clearly defined prices. Metered taxis are becoming more common in Pattaya although the drivers prefer not to use the meters and will ask for a steep fixed price for the journey. Thanks to the competition from Uber and Grab Taxi, the charges are now becoming more reasonable and once again, it is possible to negotiate but it will be down to the driver if they accept or not. This method of transport is growing in popularity and is often cheaper than using standard metered taxis. However, there is some resistance from local taxi drivers so getting an available car can prove difficult but worth a try. The advantage of this method is that the price is agreed before you confirm the taxi so there won’t be any nasty surprises. There are two main bus stations in Pattaya, one on North Pattaya Road and one on the southbound carriageway of Sukhumvit Road near the Pattaya Klang turn. From here you can travel to several destinations around the country with more destinations offered by other operators. There are also options available of Third Road and at the top of Pattaya Klang is you are looking to travel to the south of the country. If you are in Jomtien, a regular bus service runs to the airport from close to the Food Mart on Thappraya Road, near to the Thepprasit turn. 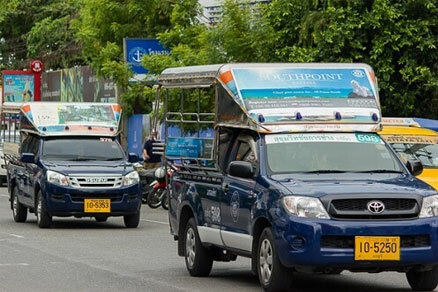 There are lots of minibus services running between Pattaya and Bangkok as well as other areas. These are a faster alternative to the larger buses with prices being similar. The downside is they are known to drive dangerously. This is an option that isn’t for the fainthearted and best avoided where possible. You can get metered and private taxis to most areas of the country. Some have fixed price lists whilst others prefer to negotiate a price. This is an excellent option if you are visiting places that aren’t directly on a bus route. Often favoured by those looking to ‘go up country’ to visit friends or relatives and gives you the chance to see more of the country. The Koh Larn ferry runs every hour daily which is convenient and well-priced. The Hua Hin passenger ferry is modern, takes under 3 hours although pricey. The service also often doesn’t run if the crossing is likely to be choppy so booking a long time in advance can cause problems. Trains are not the fastest way to get around but they are a great way to see the country. Pattaya Train station is in East Pattaya close to the Highway 7. Often, if trains run to time it is a coincidence so allow plenty of time. Work on the highspeed rail link connecting Bangkok with Rayong is due to commence shortly and will significantly shorten journey times. Domestic and international flights are available from U-Tapao aka as Pattaya International which is 40 minutes’ drive, Suvarnabhumi and Don Muang take 90 and 120 minutes’ drive respectively. Regional flights are good value. Minibuses run by Air Asia are available from Central Festival if you are planning to fly from U-Tapao and prove to be very handy. Of course, getting there under your own steam is something that many people prefer to do so there are few options here as well. Having access to your own car or motorbike certainly gives you more freedom. There are lots of reputable vehicle rental companies in the city but make sure they offer first class rental insurance. Regular or long-term renters may find it cheaper to purchase their own vehicle. New vehicles are quite expensive but hold their value well and there are naturally the same potential issues as you would find anywhere else in the world when it comes to buying a second-hand vehicle. Obtaining credit can also be a problem. Common sense obviously plays a huge role in travelling around Pattaya and Thailand. Drink driving is naturally a big no-no but there are plenty of occasions where travel can be particularly difficult. Friday afternoons always see a large increase in the volume of traffic as too do Public Holidays and weekends. Allowing plenty of time for travel is advisable as accidents are holdups are common.